1and1 control panel is not for inexperienced webmasters and newbies, but the technical merits of such a fast and reliable host cannot be overlooked. **1&1 Starter Plan does not support WordPress. The data reported and opinions expressed in this review are based on our purchase of the Basic Plan. If you value price and performance above all else, 1&1 merits your consideration. The service is inexpensive; the servers are fast; and the network is ultra-reliable. That being said, we found it tedious and difficult to set up a simple 1-page test site. A call to the technical support department was made to answer our questions and walk us through the set-up process. 1&1 is not for inexperienced webmasters and newbies, but the technical merits of such a fast and reliable host cannot be overlooked. Despite our issues with the service, and owing to its technical merits, 1&1 has earned 4 stars and the NCM Online designation of RECOMMENDED WITH RESERVATIONS. With literally millions of customers worldwide, 1&1 Internet, Inc. is one of the most successful domain registrars and website hosting companies in the industry. The technical excellence of their hosting service is undeniable. Our testing found their servers to be extremely fast and 100% reliable. 1&1 offers a range of low-cost shared Linux hosting plans. These include Basic, Unlimited, and Performance. All three are backed by a 30-day money-back guarantee and include 24/7 phone and email support. The same plans with minor feature variations are also available on Windows servers. The Basic is the cheapest of the three plans and allows you to host a single site. 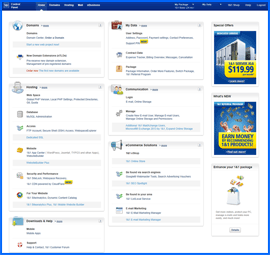 It provides up to 0.6GB of RAM, 100GB of disk space — more than adequate for most sites — a free domain name, unlimited bandwidth, up to 20 MySQL databases, up to 20 FTP accounts, up to 100 email accounts, and daily backup. The Unlimited plan includes all of the Basic’s features, while adding the ability to host an unlimited amount of sites, up to 1.2GB of RAM, unlimited disk space, unlimited MySQL databases, unlimited FTP accounts, unlimited email accounts, a mobile website builder, and 1&1’s content delivery network. 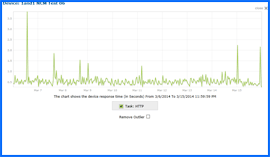 This improves site speed by serving your site from multiple datacenters around the world. Essentially it provides cloud hosting for a good deal less than you would expect to pay. While still reasonably priced, the most costly of the shared Linux plans is the Performance plan. It includes all of the Unlimited plan’s features while adding 2GB of dedicated RAM, a dedicated SSL certificate, a dedicated IP address, and expert application support. In addition to shared Linux web hosting plans, 1&1 offers shared Windows, VPS (virtual private server) plans, cloud server plans, as well as dedicated server plans (managed and unmanaged). We would prefer to say that buying and setting up a 1&1 hosting account is quick and easy, but it’s not. It is a slow, tedious, and confusing process — even for an experienced webmaster. 1and1 Control Panel. Click to enlarge. After clicking the SIGN UP button for the Basic plan you are brought to a screen where you can select a new domain, or decide to add a domain name later. There is no form field to enter a domain name you already own. After clicking through six (6!) more pages (including 2 sales pages) and completing the required information, you will finally arrive at a page in which you can enter your credit card information or select the PayPal payment option to process your order. Just when you think you’ve gotten past the worst part of setting up a 1&1 account, the ‘Welcome’ email will appear in your inbox. It includes your Customer ID (username) and a link to the 1and1 control panel login page. It does not include nameserver (DNS) or FTP login information. After logging into the proprietary control panel (screenshot above right) our first order of business was to add our domain name to the hosting plan, as there was no place to add it during the sign up process. Clicking on ‘Domains> more’ brought us to the Domains page. Unfortunately there was no ‘add a domain’ option. We clicked around for a while and decided to call support. They informed us that we had to click on ‘Order a Domain’ to add a domain we already owned. We kid you not. From there we had to run a check on the domain we already owned, and then select the button that read, ‘Point DNS to 1&1 name servers and keep your current registrar.’ After clicking ‘Next’ and then clicking through the mail server screen, the nameservers were finally revealed. Concerning the FTP login, technical support informed us that the FTP account needed to be added manually. We were able to locate the WordPress installation interface without trouble, but as 1&1 does not utilize the Fantastico Deluxe or Softaculous 1-click script installers, installation of WordPress requires the completion of a 5 page-tabbed form. 1&1 Speed Test Results Chart. Click to enlarge. How could a successful company like 1&1 be so brain dead when it comes to usability? The only answer that we could come up with is arrogance. Some companies believe they know what’s best — usability experts be damned. Clearly they did not test their sign up process or 1&1 control panel for ease of use — and it shows. That is unfortunate indeed, because the technical aspects of their hosting services are excellent. 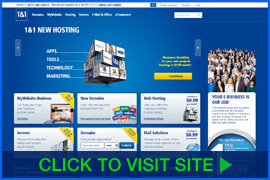 All web hosting services reviewed by NCM Online are purchased and subjected to our 10-day test for uptime and speed. Amongst the faster services we tested, 1&1 recorded an excellent speed of only 1.2661 seconds to load our test site from 13 locations worldwide (screenshot above right), and 1.1043 seconds from 7 U.S. locations. Tested for uptime every 15 minutes over 10 days, 1&1 produced a perfect 100% reliability score (screenshot below right). 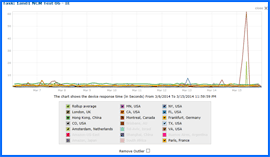 1&1 Uptime Test Results Chart. Click to enlarge. If you can endure the sign-up process and don’t mind taking the time to learn the proprietary 1and1 control panel, the excellent technical qualities and relatively low cost of 1&1’s web hosting services warrant your consideration. 1&1 has earned 4 stars and is recommended with reservations by NCM Online. Cheap website hosting company price comparisons based on 1-year term list price before coupon/promo codes or limited time/introductory offer discounts. These are the renewal rates for the second year of hosting. To ensure that you receive the most affordable 1&1 pricing possible, please visit our Web Hosting Coupon Codes page for current discounts and special offers before making any purchases. If you are looking for a reliable web host you should choose one of the leading global web hosting providers. 1&1 Internet Inc. has a global community that comprises of twelve and a half million customers. The company is profitable, financially stable and gaining ground every day. 1&1 Internet offers eShops, powerful dedicated servers, private virtual servers, web hosting plans and affordable domains. 1&1 Internet began life as resellers of technological products. Their earlier services included an online service that was created by Ralph Dommermuth who has since gone on to become the Chief Executive Officer of United Internet. This company is now the parent company of 1&1. The company offers a range of packages that include powerful dedicated servers, private virtual servers, feature-rich web hosting plans and convenient domain packages. In fact, 1&1 Internet offer web services that cater for all levels of skill and all budgets. Many people who have never built a website before will be able to create a unique site using new products such as MyWebsite. This type of package will particularly appeal to small and medium business enterprises that need to construct websites. All of the 1&1 products are well-designed and affordable. There are no hidden charges or pricing gimmicks. Businesses that need to generate web-awareness will recognize the importance of good domain names. 1&1 Internet are official registrars for many TLDs (top-level domains) and the firm has now registered over nineteen million domains for private and business clients. 1&1 have customers all over the world and they work in close conjunction with Afilias and ICANN. 1&1 want all of their clients to create a secure place on the Internet and they will provide every customer with all of the necessary resources. 1&1 Internet offers their customers reliable high-quality domains that are one hundred per cent secure. The data centers have been created using the latest technology and the global network will withstand the toughest conditions. 1&1 systems are stable and powerful, hence they are able to market web products that are dependable and innovative. 1&1 Internet utilizes Eco-friendly equipment and the latest hardware in their data centers. The company’s main data center in Kansas has been recognized by the EPA (The US Environmental Protection Agency). The center has gone on to become a Green Power Partner. 1&1 Internet aims to be as energy-efficient as possible and the firms green initiatives have prevented thirty thousand tons of CO2 emissions a year. 1&1 Internet utilizes products sourced from the world’s leading technology manufacturers. This ensures that all customers benefit from 99.9% up-time. 1&1 Internet uses Foundry and Cisco routers in their data centers and the state of the art technology ensures that data centers located in Europe and the US are efficient and secure. The 1&1 Internet data center in Kansas is well-located. Users who reside on both coasts will receive maximum up-time .1 has strong bonds with important companies like Symantec and Parallel. This ensures that all customers benefit from the latest security and virtual software. This video tutorial demonstrates the installation of WordPress on a 1&1 shared hosting account using their proprietary control panel and application installer.